This post is the 100th post at islandprofiles.com! Its hard to believe, but true. 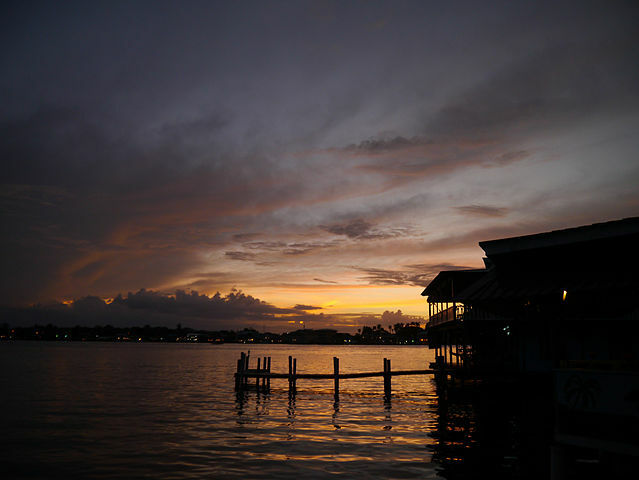 Today we finish up our visit to Bocas del Toro and focus on the food and drink of the Bocas Archipelago. 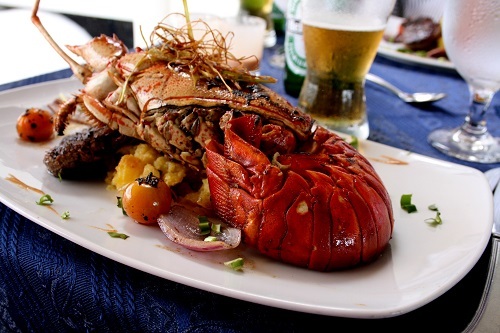 The cuisine of the Bocas del Toro Archipelago is influenced by Afro-Antillean traditions, brought by settlers from Jamaica and other parts of the West Indies. The cuisine has a reputation for being hearty, spicy and filling. 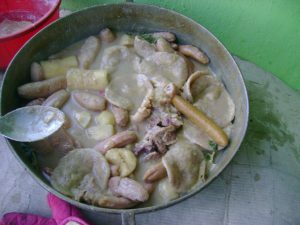 One dish that you are likely to encounter is rondón, a seafood soup made with coconut milk, plaintains and vegetables. The name is a mutation of ‘run down’, as in running or going down somewhere to look, presumably for ingredients. 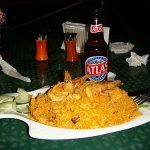 One pot is a Jamaican/Panamanian rice dish, typical of Bocas. Also simply known as rice and beans, or rice and peas (Afro-Antilleans use the terms beans and peas interchangeably), it is made by combining rice and beans with coconut milk and spices and accompanied by fish or chicken. Escabeche is a popular pickled fish dish and souse refers to pickled pigs feet. Bragadá is a type of fried codfish cake, and patí is a spicy meat turnover. Coconuts and plaintains are abundant and figure in to many of the regions dishes. Desserts are no exception and coconut pies and plantain tarts are favorites. Interesting beverages include chicheme, a drink made from boiling hominy or corn in coconut or condensed milk. 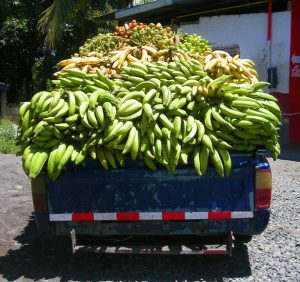 Similar concoctions include michilá, made the same way, but with boiled plaintains and muogó which uses green bananas. Even more interesting is ‘icing glass’, a drink made from seaweed and condensed milk. It may also contain cinnamon and be spiked with rum, brandy or vodka. Chocolate is something that the Panamanians are expert at, along with coffee. While the coffee comes from the mountainous interior of the isthmus, first rate chocolate is made in Bocas del Toro province and cacao farm tours are easily accessible from Bocas Town. Popular tours include the Oreba and Green Acres chocolate farms. Even if you miss taking a tour, be sure to pick up some chocolate at one of the many shops or cafes in Bocas Town. Don’t miss Bocas Brewery for locally brewed craft beer. The brewery offers a wide selection of house made beers, a full menu, live entertainment and plenty of outdoor space to take in the spectacular sunset. For something non alcoholic, try the housemade sodas or kombucha. While in Bocas, don’t miss the opportunity to admire some of the beautiful indigenous crafts and products. Molas are intricately crafted panels with geometric designs worn on the front and back of women’s blouses. 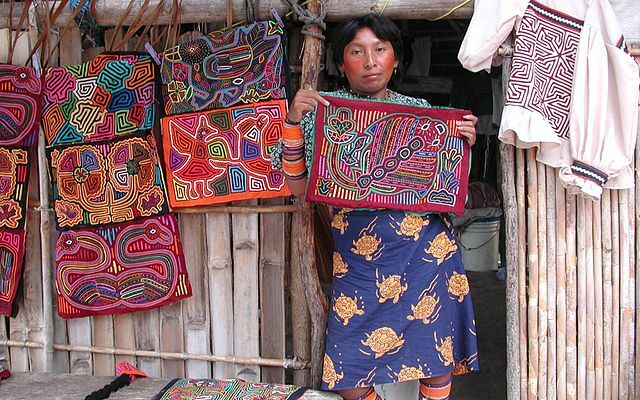 Molas are popular with tourists who purchase them for framing or to sew on to pillows. A very labor intensive art, the authentic mola will show some signs of wear or fading, which means that the woman who wore it decided to change her style a bit and create a new one. Festivals in Bocas include Carneval, the five day party before the beginning of lent. Music, dancing and young boys dressed as red devils, or diablitos are but a few of the reasons to participate in the festivities. The red devils are young boys, but as they grow older, black pieces are added to their costume until they are men and the costumes are entirely black. 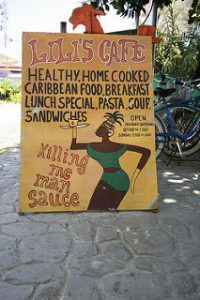 Salsa, calypso and reggae music set the atmosphere. Games, carnival rides, arts and crafts and, of course, a queen of the carnival all add to the fun and excitement. Feria del mar, or ‘fair of the sea’, takes place in September. Also lasting 5 days, the music, dancing and partying culminate in boat races featuring motorized pangas to hand made canoes (cayucos). The festival was created to celebrate fisherman, boaters and the sea. 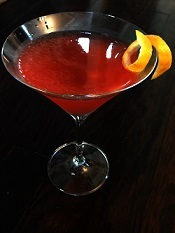 And of course, there is a special cocktail to celebrate our online journey to Bocas del Toro. This one took a lot of experimenting, but I am very happy with the end result, which combines elements of Caribbean and Spanish culture along with a nod to the prominent role of the banana in Bocas history. The title is not something I made up. Bocatorita is a lagoon on the east of Isla Cristobal, where channels through the mangroves form a four mile wide natural maze containing fish, manatees and bootle-nose dolphins. Makes a good name for a tequila based Bocas del Toro inspired drink, though! Shake all ingredients together with ice and strain into cocktail glass. Garnish with lemon twist.